Customize this Sorrento private tour. Longer tours available. Add a private tour of Pompeii or a visit to an organic winery by Mt. Vesuvius with lunch. Inquire. 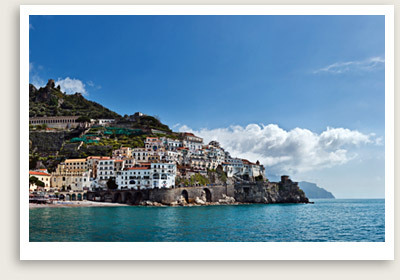 Departure Points: Naples, Amalfi, Positano. Other departure points available. Please inquire. Our Sorrento Private Tours Include: Private transportation, driving guide, taxes, toll, parking. This Sorrento private tour features a relaxing walk along the elegant streets of this world-famous holiday resort, rich in history, fashion and breathtaking seaside views. Included in this private tour of Sorrento is a visit to a lemon and orange grove located in the heart of the town – a treat for the eyes, nose and mouth! Custom private tours of Sorrento and surrounding destinations or are available. Please inquire.